Jesus came to us in the innocence of a newborn babe, yet spiritually He was with God before the foundation of the world. He is the word of God made flesh and came to dwell among man, and those who receive Him and believe upon His name are born of God and His Spirit. (John 1:12-14). But as many as received him, to them gave he power to become the sons of God, even to them that believe on his name: Which were born, not of blood, nor of the will of the flesh, nor of the will of man, but of God. And the Word was made flesh, and dwelt among us, (and we beheld his glory, the glory as of the only begotten of the Father,) full of grace and truth. Although we are born in the flesh Jesus gave the perfect example of the importance of living by the Spirit of God and not to sow to the flesh which is contrary to the Spirit. So we do not miss what behavior will or will not inherit heaven scripture outlines it simply for us in the book of Galatians. (Galatians 5:16-26). 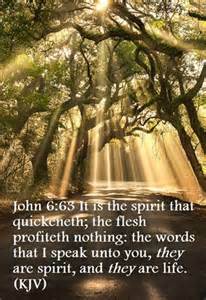 This I say then, Walk in the Spirit, and ye shall not fulfil the lust of the flesh. For the flesh lusteth against the Spirit, and the Spirit against the flesh: and these are contrary the one to the other: so that ye cannot do the things that ye would. But if ye be led of the Spirit, ye are not under the law. Now the works of the flesh are manifest, which are these; Adultery, fornication, uncleanness, lasciviousness, Idolatry, witchcraft, hatred, variance, emulations, wrath, strife, seditions, heresies, Envyings, murders, drunkenness, revellings, and such like: of the which I tell you before, as I have also told you in time past, that they which do such things shall not inherit the kingdom of God. But the fruit of the Spirit is love, joy, peace, longsuffering, gentleness, goodness, faith, Meekness, temperance: against such there is no law. And they that are Christ’s have crucified the flesh with the affections and lusts. If we live in the Spirit, let us also walk in the Spirit. Let us not be desirous of vain glory, provoking one another, envying one another. The Spirit of God is life giving and Jesus even taught how it was up to His Father who it is that would be drawn to Him, the flesh profits nothing but the Spirit given us is eternal. (John 6:44,45,63-65). By doing the will of God is the only sure way of knowing we are not fulfilling the lust of the flesh, but are living in the righteousness God has called us to. (1 John 2:15-17). Love not the world, neither the things that are in the world. If any man love the world, the love of the Father is not in him. For all that is in the world, the lust of the flesh, and the lust of the eyes, and the pride of life, is not of the Father, but is of the world.And the world passeth away, and the lust thereof: but he that doeth the will of God abideth for ever.